For other people named Robert Morse, see Robert Morse (disambiguation). Robert Alan Morse (born May 18, 1931) is an American actor and singer best known as the star of both the 1961 original Broadway production and 1967 film adaptation of How to Succeed in Business Without Really Trying, and as Bertram Cooper, from 2007 to 2015, in the AMC dramatic series Mad Men. Morse was born on May 18, 1931 in Newton, Massachusetts, the second child of Charles Morse and Mary SIlver. He attended a number of different schools until finding his inspiration in Henry Lasker, a drama teacher at Newton High School. "He knew what I had burning in me and wanted to express." Upon graduation, he left home for New York City to fulfill his ambition of becoming an actor, joining his elder brother Richard who was already studying acting at the prestigious Neighborhood Playhouse. With almost lightning speed he wound up with a role in The Proud and Profane (1956), a film starring William Holden and Deborah Kerr (although uncredited, he did manage to work for five to six weeks on the film at the lofty sum of $500 a week). Soon thereafter, he was cast as Barnaby Tucker in the original Broadway production of Thornton Wilder's The Matchmaker, and his career was off and running. Morse has earned multiple nominations and wins for Tony, Drama Desk and Emmy awards over a period of five decades. He is well known for his appearances in musicals and plays on Broadway, as well as roles in movies and television shows. Perhaps best known for his role as young 1960s New York City businessman J. Pierrepont Finch in the 1961 Broadway production and 1967 film version of the Frank Loesser and Abe Burrows musical, How to Succeed in Business Without Really Trying, Morse gained new prominence in the late 2000s for his recurring role of elder 1960s New York City businessman Bertram Cooper on the AMC television show Mad Men. Having already played Barnaby on Broadway, Morse reprised the role in the 1958 film adaptation of The Matchmaker, this time opposite Shirley Booth. That same year, he won the Theatre World Award and was nominated for the Tony Award for Best Performance by a Featured Actor in a Play for Say, Darling. What was considered the final step toward full stardom was his performance as J. Pierrepont Finch in the Pulitzer Prize-winning How to Succeed in Business Without Really Trying. It won him the Tony Award for Best Performance by a Leading Actor in a Musical in 1962. He also starred in the 1967 movie version. In 1964, Morse co-starred in the comedy film Quick, Before It Melts. In 1965, Morse appeared in the black comedy film The Loved One, a movie based on the Evelyn Waugh novel of the same name that satirized the funeral business in Los Angeles, in particular the Forest Lawn Cemetery. In 1967, he co-starred in A Guide for the Married Man, opposite Walter Matthau. In 1968, he appeared in the comedy Where Were You When the Lights Went Out? opposite Doris Day. In the same year, he appeared in the 1968 television series That's Life, which attempted to blend the musical genre with a situation comedy centered on newlyweds "Robert" and "Gloria" (played by E. J. Peaker). In 1987, Morse also appeared in the movie The Emperor's New Clothes, which starred Sid Caesar and was part of the Cannon Movie Tales series. Morse was in the original Broadway cast of Sugar, a 1972 musical stage adaptation of Some Like It Hot, for which he was nominated for another Tony. He won a Tony for Best Performance by a Leading Actor in a Play and the Drama Desk Award for Outstanding One-Person Show for his portrayal of Truman Capote in Tru (1989). In 1992, he recreated his performance for the PBS series American Playhouse and won the Emmy Award as Best Actor in a Miniseries or Special. In 1999, Morse was inducted into the American Theater Hall of Fame for his long career as a stage actor. In 2002, Morse was cast in the role of the Wizard of Oz in the San Francisco run of the musical Wicked, but quit the show before it opened on Broadway. He was replaced by Joel Grey. Morse joined other performers, including Marlo Thomas, in creating the 1972 Free to Be... You and Me children's album. He also provided the voice for the cartoon character Howler in Hanna Barbera's Pound Puppies. Another famous role he played was Jack in the 1979 animated Rankin/Bass special Jack Frost. In The First Easter Rabbit, also by Rankin/Bass, he was the voice of the main character, Stuffy. Morse has appeared in dozens of TV shows going back to the live days of television with the Kraft Theatre and General Electric Theatre. He appeared as Boss Hogg's devious nephew, Dewey Hogg, in The Dukes of Hazzard sixth-season episode "How to Succeed in Hazzard" (1984). He had featured roles in the 1993 miniseries Wild Palms and the 2000 medical drama City of Angels. He also appeared in five episodes of the CBS Radio Mystery Theater from 1974 to 1976. Beginning in 2007, Morse took on a recurring role in the AMC dramatic series Mad Men as Bertram Cooper, a partner in the advertising agency Sterling Cooper, for which role he was nominated for a Primetime Emmy Award for Outstanding Guest Actor in a Drama Series in 2008, 2010, 2011, 2013, and 2014. He will be in the Broadway revival of The Front Page at the Broadhurst Theatre starting on September 20, 2016. Morse has been married twice and has five children. 1955 Goodyear Playhouse N/A Episode: "Man on Spikes"
1956 The Alcoa Hour Jiya Episode: "The Big Wave"
1956 Matinee Theatre Larry Episode: "Eye of the Storm"
1957 Matinee Theatre Frank Wilson Episode: "Rain in the Morning"
1959 Alfred Hitchcock Presents Phil Episode: "Touché"
1959 Play of the Week Gustave Episode: "Thieves Carnival"
1960 Alfred Hitchcock Presents Len Episode: "Hitch Hike"
1960 Play of the Week Professor Pearson Episode: "The Velvet Glove"
1961 Shirley Temple's Storybook Drum Carpenter Episode: "Rebel Gun"
1961 Naked City Richy Wilkin Episode: "Sweet Prince of Delancey Street"
1971 Alias Smith and Jones Fred Philpotts Episode: "The Day They Hanged Kid Curry"
1971 Night Gallery Roger Blacker Episode: "Marmalade Wine"
1971 Love, American Style N/A Episode: "Love and the Ledge"
1974 Love, American Style Everett Episode: "Love and the Forever Tree"
1978 Fantasy Island Barney Shore Episode: "The Island of Lost Women"
1982 All My Children Harry the Bookie Episode: "20 July 1982"
1983 One Day at a Time Frank Sampson Episode: "Worried Heart"
1983 Masquerade N/A Episode: "Pilot"
1984 The Fall Guy Sky Kelly Episode: "Rabbit's Feet"
1984 The Dukes of Hazzard Dewey Hogg Episode: "How to Succeed in Hazzard"
1984 Tales of the Unexpected Stephen Shaw Episode: "Sauce for the Goose"
1985 Murder, She Wrote Marc Faber Episode: "Broadway Malady"
1985 Trapper John, M.D. Honest Wayne McIntyre Episode: "A False Start"
1985 The Twilight Zone Cupid Episode: "Ye Gods"
1986 You Again? Officer Morton Episode: "The Lush Life"
1992 Tiny Toon Adventures Goopy Geer (voice) Episode: "Two-Tone Town"
1992 American Playhouse Truman Capote Episode: "Tru"
1995 Aaahh!!! Real Monsters Dootch (voice) Episode: "Where Have All the Monsters Gone?" 1997 Rugrats Mr. Koch (voice) Episode: "Faire Play"
1997 Superman Desaad (voice) Episode: "Father's Day"
1997 Union Square Santa Claus Episode: "Jack Gets a Hot Tip"
1998 Suddenly Susan Uncle Bert Episode: "The Thanksgiving Episode"
1999 The Wild Thornberrys Jake (voice) Episode: "Two's Company"
2007 Jeff Ltd. Ron Episode: "Too Many Hens in the Foxhouse"
2014 The Legend of Korra Governor (voice) Episode: "After All These Years"
2015 Teen Titans Go! Santa Claus (voice) Episode: "The True Meaning of Christmas"
2016 Animals. Old Phil (voice) Episode: "Flies." ↑ Fear, David. "Mad Men's Robert Morse on Dancing Into the Sunset". Rolling Stone. ISSN 0035-791X. ↑ Simonson, Robert. ""Mad Men" and In Your Arms Star Robert Morse on Making Jon Hamm Cry". www.playbill.com. Retrieved 25 July 2014. ↑ "Robert Morse". Ibdb.com. Retrieved 25 July 2014. ↑ Itzkoff, Dave (May 27, 2014). 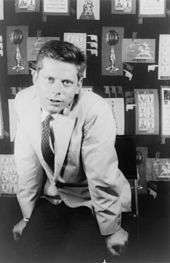 "Robert Morse on His Big 'Mad Men' Number". New York Times. Retrieved 25 July 2014. ↑ "TonyAwards.com – The American Theatre Wing's Tony Awards – Official Website by IBM". IBM Corp., Tony Award Productions. Retrieved 10 March 2011. 1 2 Hutchings, David (January 15, 1990). "His Boyishness a Casualty of Age and Experience, Robert Morse Is Reborn as Truman Capote". People. ↑ "On Stage: New class of theater hall of famers". Pittsburgh Post-Gazette. ↑ David Cote (2005). Wicked: The Grimmerie: A Behind-the-Scenes Look at the Hit Broadway Musical. Hyperion. ISBN 1-4013-0820-1. ↑ "Extra, Extra: Full Cast and Theatre Announced for Broadway Front Page | Playbill". Playbill. Retrieved 2016-08-21.